During a luncheon aboard the MS Veendam, the Holland America Line showed off its Signature of Excellence enhancements, a makeover program costing $525 million that will take place on a total of five of the fleet’s midsize ships, with enhancements ranging from subtle touch-ups to extraordinary additions. The most apparent enhancement is the Retreat, a new resort-style pool on the aft portion of the ship. Here, shallow, eight-inch waters encompass a series of lounge chairs so guests may soak their feet while catching rays ? a new standard in relaxation. In addition, the Retreat offers a new pool bar, the pizzeria Slice, and a massive LED screen used specifically for nightly movie showings. The bars and casino have also been rearranged into a multi-themed area known as Mix, where three separate bars will serve their namesake libation: martinis, champagne, and spirits and ales. 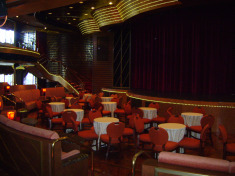 The Showroom at Sea, the main show lounge, has been remodeled with a new elegance and aura of a Las Vegas theater. The public areas are not the only spaces receiving renovations. A new category of rooms, the Lanai staterooms, has also been added by replacing the former stateroom windows with new Lanai doors that open directly onto the walk-around promenade. Additionally, all staterooms received new décor and carpeting as well as new bathroom cabinetry and vanities. Each ship will see between 44 and 46 new staterooms, 38 of which will be of the Lanai category. The ms Veendam and Rotterdam have already completed the two-phase enhancement process, however, the Statendam will not be completed until December of 2012, while the Ryndam and Maasdam will be completed in the spring and fall of 2013, respectively. For more Holland America news and information, visit www.hollandamerica.com.